In all seriousness, I’ll try to maintain my sanity long enough to finish telling you what a perfect make-ahead work lunch this salad is. Once your tofu is baked and beautiful, all that’s left to do is setting up your counter assembly-line style and stuffing some containers full of all your favorite veggies. For a bed of leafy greens, I filled half of my salads with kale and the other half with romaine, just for variety. Then for the crunch factor I threw in sweet bell peppers, slivers of broccoli and thinly sliced green onions. Finally in the morning before work each day, I added a quarter avocado and a splash of simple vinaigrette for optimal freshness. Totally doable! And if saving money is one of your lunch-packing motivations, I should point out that this is majorly budget-friendly. A whole block of tofu is less than 2 dollars, and you won’t pay much more than that for the rest of the seasonal produce underneath! One final suggestion: halfway through the week I found myself with some leftover brown basmati rice, so I packed a little portion in a separate Tupperware, microwaved it at lunchtime and spooned it over the salad. SO SATISFYING, especially with the kale-based salads. The aroma and warm grainy texture were perfect with the fresh veggies, and it felt extra-filling in the most healthful way. 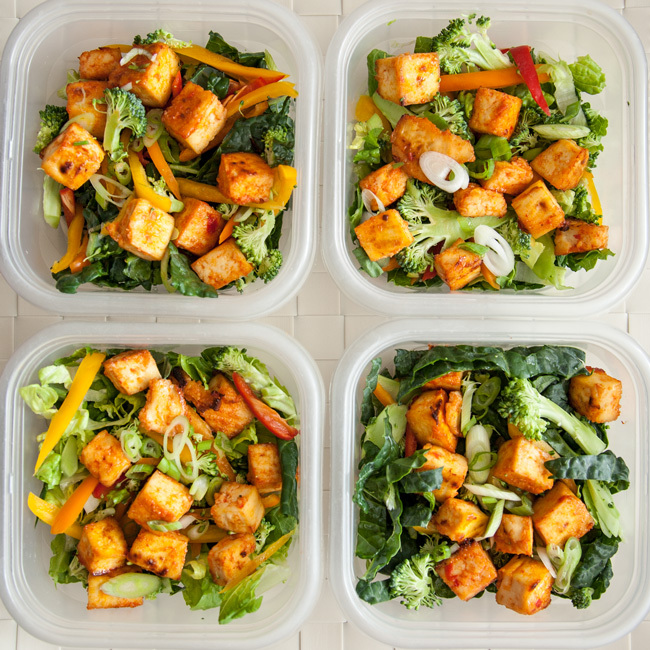 Even if you’re not a meal-planner, do yourself a favor and bank a stash of healthy lunches next week! 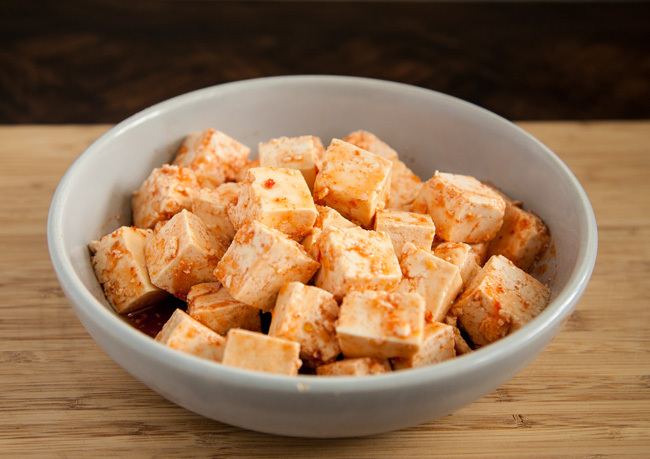 Chop tofu into 1-inch cubes and toss in a medium bowl with the sweet chili sauce and sriracha. Cover with plastic wrap and allow to marinate in the refrigerator for at least an hour, or preferably overnight. When ready to bake, preheat oven to 400 F and cover a baking sheet with parchment paper or aluminum foil. 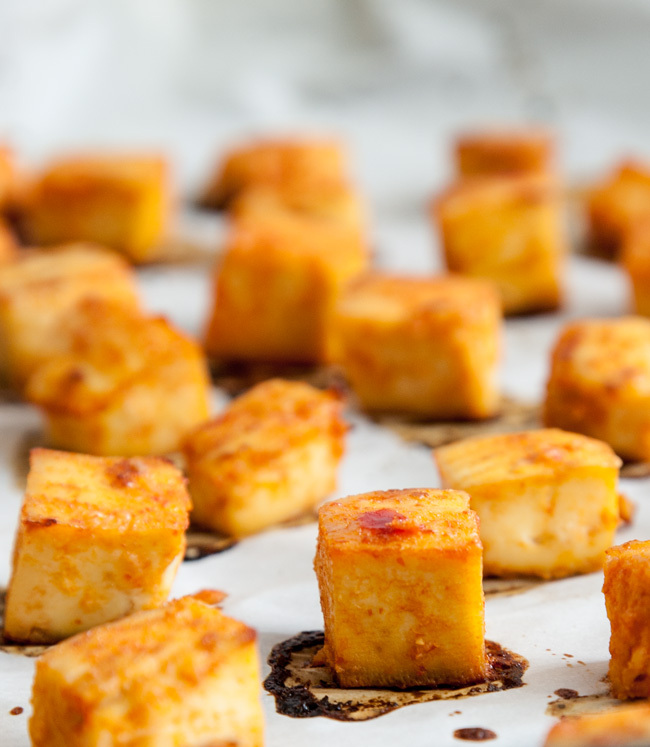 Place the tofu cubes in a single layer on the prepared baking sheet. 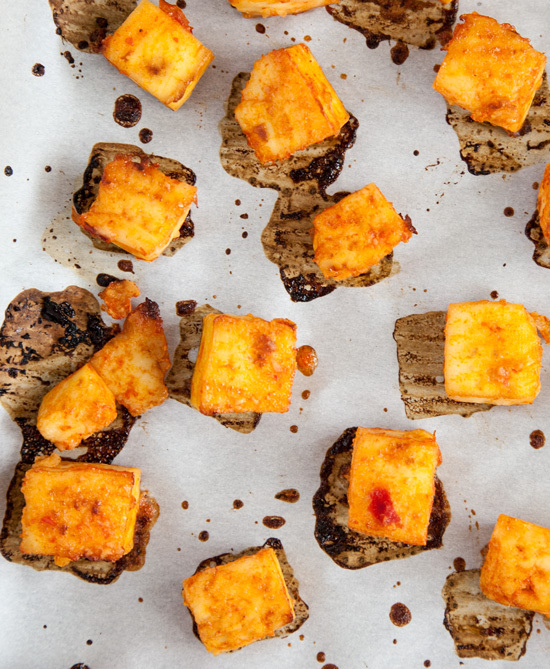 Bake the tofu for about 30 minutes or until golden, flipping the cubes halfway through the baking time. 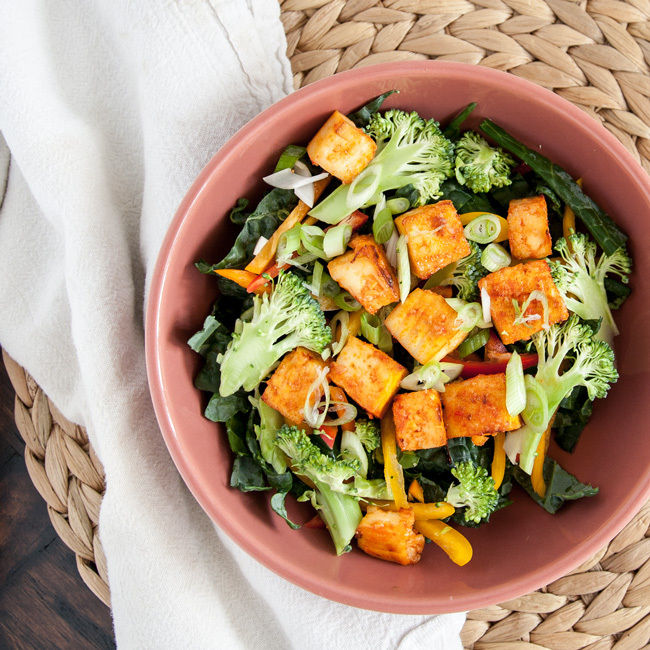 Assemble the salads with greens, peppers, broccoli, green onions, and the tofu on top. The salads can be refrigerated at this step in sealed containers for about five days. Add avocado and dressing immediately before serving. 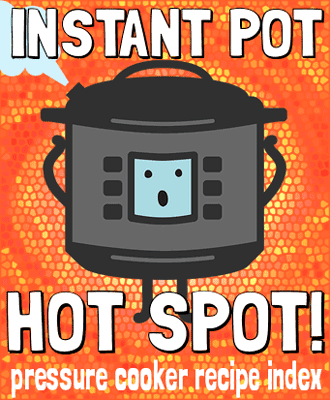 Serve with warm brown rice, or another grain, if desired. This looks SO good!! I haven’t cooked with tofu in such a long time. Whenever I do try, it always seems to fall apart on me haha. I’ve never tried baking it though! You can see in the uncooked photo that it can crumble a little when stirring in the glaze, but nothing too crazy. And once they’re on the baking sheet, they’re indestructible, haha. It’s really effortless, I promise! 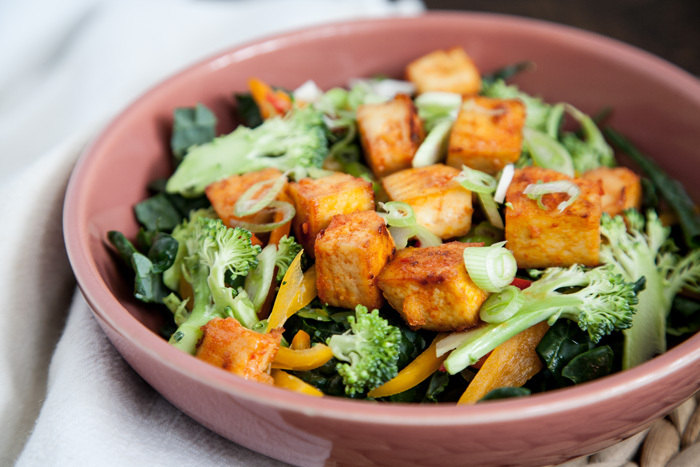 Having loved tofu all my adult life, it was easy to quit eating meat years ago. I pan fry tofu slices and have salads full of tofu, but while in Whole Foods the other day, I was tempted enough to buy a container of their Chili Tofu. I have thought of very little but, since then. I took out my press and prepared the tofu as per your suggestions and let set overnight. I was so looking forward to supper tonight, and it was as good as Whole Foods. But a whole lot more affordable, which makes it even yummier. Thanks for the recipe. 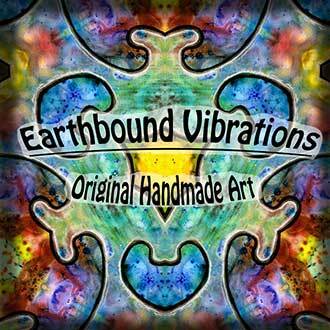 I’m very grateful! Thanks for taking the time to comment, I am so glad that you liked the recipe!! Definitely more economical than the original, isn’t it?